Just as the five cities of Colchester, Lincoln, York, Gloucester, and St. Albans, stand on the sites and in some fragmentary measure bear the names of five Roman municipalities, so Isca Dumnoniorum, now Exeter, appears to have been a cantonal capital developed out of one of the great market centres of the Celtic tribes, and as such it was the most westerly of the larger Romano-British towns. The legendary history of the place, both temporal and ecclesiastical, goes far back to the days when, for a late posterity, it is difficult to separate fact from fable. It is, however, quite established that here was the capital of the Dumnonii, the British tribe whose dominions included both Devonshire and Cornwall, and who named their capital Caer-uisc, the city of the waters. 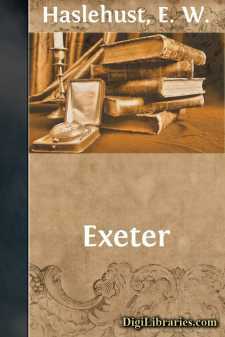 With the coming of the Saxons, the river, the Roman Isca, became the Exa, and the city was called Exanceaster, modified in due course to Exeter. In point of position, on a mound rising from the river, it was a splendid site for a fortress in the days of hand-to-hand warfare, and the military value of the site lends support to the statement of some writers that the Romans utilized the British fortifications and built a castle. In few places of its size can one see so clearly the extent of the old walled town, while the disposition and formation of its outer ring of houses, on the lower slopes of the mound, show very clearly the limits of the mural circumvallation before the city burst asunder its tight-fitting belt of stone, within which, for the safety of its populace, it had been imprisoned for centuries. Climb the higher parts for a bird's-eye view of the city, and the scene is entrancing. We look down upon the calm-flowing Exe threading its way through the valley till it debouches at Exmouth; on the riverside beneath us is the quay, with coasting schooners and barges moored alongside, and sundry bales of merchandise heaped upon the wharf, as though the people were playing at commerce to remind the world at large that Exeter was once an important port, although some ten miles from the river's mouth. But the Exe, in a quiet way, has much to boast of in the nature of beauty and romance, particularly where it flows past the wooded grounds of Powderham Castle, the Devonshire seat of the great Courtenay family. Truly there is much to redeem modern Exeter and make it interesting over and above its historical atmosphere. Yet with comparatively few vestiges of age the city has an historical past. In both a religious and a military sense she has played a part in the annals of England, and more than one ancient document in the Library of the Dean and Chapter bears testimony to her honour, her valour, and her glory. It is a city which has the impress of many ages and many minds stamped upon it. Here each influence—military from the Roman legions, ecclesiastical from the Saxon prelates, feudal from the Norman lords—has sunk deeply into the land, and has affected the general plan of the numerous buildings, as it has moulded the slowly succeeding phases of the civic and the religious life. It is no mere dream of the early ages, no sentimental reverie of mediævalism. It is enough to go through the streets, noting the remnants of the ancient walls, the brutal strength of the surviving fragment of the castle, the sheltered position of the tidal basin, the many churches dedicated to the honour of Saxon saints, the proud beauty and massiveness of the Cathedral, if one would realize, not the fancies of the artist and the poet, but the hard facts of history that made the ancient days so great, and which have caused our own days to be so full of their memories.